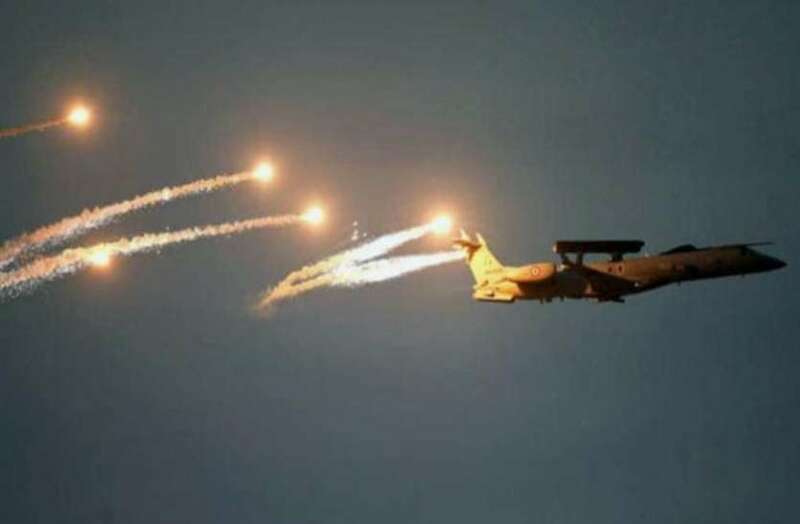 Combat jets of the Indian Air Force bombed terror camps at multiple locations across the Line of Control on the Pakistani side in a pre-dawn strike on Tuesday, 12 days after the Pakistan-based terror group, Jaish-e-Mohammed carried, out the Pulwama attack in Kashmir, government sources said. They said the Mirage 2000 fighter jets pounded JeM terror camps in Balakot, Muzaffarabad and Chakoti in the well-planned strike, destroying the camps. Defence Minister Nirmala Sitharaman briefed Prime Minister Narendra Modi on the operation. Hours later, Prime Minister Modi chaired a meeting of Cabinet Committee on Security which was attended by Finance Minister Arun Jaitley, External Affairs Minister Sushma Swaraj, Home Minister Rajnath Singh and Sitharaman. The sources said significant damage has been inflicted on the ground on the Pakistani side. A source indicated that the operation was carried out between 3:50 AM and 4:05 AM. In Islamabad, Pakistan Foreign Minister Shah Mahmood Qureshi called an “emergency meeting” at the Foreign Office for consultations, sources said. Qureshi will meet Pakistan Prime Minister Imran Khan after the meeting in which he will discuss the security situation with high-level officials, they said. In an early morning tweet, Major General Asif Ghafoor, director general of the Inter-Services Public Relations (ISPR), the media wing of the Pakistan Army, said Indian aircrafts intruded from the Muzaffarabad sector. “Facing timely and effective response from Pakistan Air Force released payload in haste while escaping which fell near Balakot. No casualties or damage,” Ghafoor said in a tweet. “Indian Air Force violated Line of Control Pakistan. Pakistan Air Force immediately scrambled. Indian aircraft gone back,” he claimed. India had put all IAF bases in the western sector on maximum alert after the Pulwama attack in which 40 CRPF personnel were killed. After the Pulwama attack, Modi announced that the armed forces have been given full freedom to respond to the strike. Hours after the strike, the Indian Army tweeted a Hindi poem which says that “if you are docile and polite before the enemy, he may consider you as a coward, the way Kauravas treated Pandavas”. The poem by Hindi poet Ramdhari Singh ‘Dinkar’ was tweeted by Additional Director General, Public Information on its official handle. Peace overtures, the poem says, are possible only when you are in a powerful position and capable to win. Its a moment of great pride for the nation that Indian Air Force successfully struck on the terror camps in Pakistan today. Under the leadership of PM Shri @narendramodi ji message is loud & clear that #NewIndia will not tolerate acts of terror or spare perpetrators of terrorism. Patel had been sidelined and the harm was done. Seventy years later, India is still suffering from the blunder then committed. Such a tragedy! Indian security forces can defend the country’s territories bravely, said Home Minister Rajnath Singh on Monday, August 21. “India has never attacked any country, nor does it have an ambition to expand its borders. Security forces are equipped to handle any situation (at the border),” he further added. The home minister said he wanted to convey a message to all neighbouring countries that India wanted peace. The ITBP guards the 4,057 km long Sino-Indian border from Jammu and Kashmir to Arunachal Pradesh. India and China have been locked in a face-off in the Doklam area of the Sikkim sector after Indian troops stopped the Chinese Army from building a road in the area over the last two months. China has been ramping up rhetoric against India over the last few weeks demanding immediate withdrawal of Indian troops from Doklam. The Chinese state media, particularly, have carried a barrage of critical articles on the Dokalam stand- off slamming India. China on Wednesday said it has conveyed its firm stand to India that it must take “concrete actions” by immediately pulling back troops from Dokalam in the Sikkim section with “no strings attached” to resolve the current standoff. Providing the details of the July 28 meeting between National Security Advisor Ajit Doval and State Councillor Yang Jiechi for the first time, Chinese Foreign Ministry told PTI that the two officials exchanged views on BRICS cooperation, bilateral relations and relevant major problems. Doval was in Beijing last month to attend the BRICS — Brazil, Russia, India, China, South Africa — NSA’s meeting. Doval and Yang are also the Special Representatives of the boundary talks between the two nations. Yang held bilateral meeting with Doval “at his request and in accordance with the practice”, the ministry said in a written reply to a question about the discussions relating to the standoff at Dokalam which began when China started constructing a road in the area. “Yang Jiechi expressed China’s stern positions and explicit requirements on the trespass of Indian border troops into China’s territory at the Sikkim section of China-India boundary,” it said, indicating that there was no breakthrough during the talks between Doval and Yang. India’s position on the issue was made clear by External Affairs Minister Sushma Swaraj last month, saying both sides should first pull back their troops for any talks to take place, favoring a peaceful resolution of the border standoff. The Foreign Ministry also posted a 15-page fact sheet with maps and other details about the standoff since it began on June 16. Bhutan had protested to China, saying that the area belonged to it and accused Beijing of violating agreements to maintain status quo until it is resolved. The fact sheet said on June 18 about 270 Indian troops entered more than 100 meters into the Chinese territory to “obstruct the road building of the Chinese side, causing tension in the area”. “Over 400 people at one point, have put up three tents and advanced over 180 meters into the Chinese territory,” it said. “As of the end of July, there were still over 40 Indian border troops and one bulldozer illegally staying in the Chinese territory,” it said. Doka La is the Indian name for the region which Bhutan recognizes as Dokalam, while China claims it as part of its Donglang region. The fact sheet said the standoff occurred in an area where there is a clear and delimited boundary. “This makes it fundamentally different from past frictions between the border troops of the two sides in areas with – boundary. The Indian border troops? crossing of the already delimited boundary is a very serious incident as it violates China’s sovereignty and territorial integrity,” it said. The fact sheet said that no such attempt would be tolerated by any sovereign state. “The fact of the matter is that it is India which has attempted time and again to change the status quo of the China-India boundary in the Sikkim Sector, which poses a grave security threat to China,” it said. “The China-Bhutan boundary issue is one between China and Bhutan. It has nothing to do with India. As a third party, India has no right to interfere in or impede the boundary talks between China and Bhutan, still less the right to make territorial claims on Bhutan’s behalf,” the fact sheet added. “No country should ever underestimate the resolve of the Chinese government and people to defend China’s territorial sovereignty. China will take all necessary measures to safeguard its legitimate and lawful rights and interests,” it warned. “The incident took place on the Chinese side of the delimited boundary. India should immediately and unconditionally withdraw its trespassing border troops back to the Indian side of the boundary. This is a prerequisite and basis for resolving the incident,” it added. The fact sheet said China values the growth of good- neighborly and friendly relations with India and is committed to maintaining peace and tranquility in the border area between the two countries. “ Kashmir is ours, Kashmiris are ours and Kashmiriyat is also ours,” Union Home Minister Rajnath Singh said on Sunday, asserting that the Modi government will find a “permanent solution” to the Kashmir problem. The Home Minister’s assertion came amid continued unrest in the Kashmir Valley. Addressing a public reception here, Mr. Singh accused Pakistan of fomenting trouble in Kashmir. “But I want to tell all of you that our government will find a permanent solution to the Kashmir issue,” he said, without elaborating. The Minister deplored the fact that was no change in the “attitude” of Pakistan which wanted to “destabilise” India. “We hope that Pakistan will change. If it does not change, we will have to change them. After globalisation, one country can’t destabilise another country as the international community will not forget it,” he said. Unrest has continued in Kashmir since the killing of militant commander Burhan Wani in an encounter in July last year. There has been an unprecedented involvement of students in the protests, with even girls taking to the streets to fight pitched battles with security forces. Around 80 people have lost their lives in the prolonged violence. Mr. Singh said heads of government of all neighbouring countries, including Pakistan, had been invited to the swearing-in ceremony of the Modi government in 2014 in an indication that India wanted friendly relations with them. He also visited the Nathu La border post, besides a few posts of the Indo-Tibetan Border Police and SSB along the Sino-India and Indo-Nepal borders respectively. Indian Army has conducted a counter-strike on Pakistani border posts along the Line of Control (LoC), days after two Indian soldiers were martyred and their bodies mutilated by Pakistani troops. A video footage has surfaced showing Pakistani bunkers being destroyed after a mortar fire was launched by the Indian Army near Jammu and Kashmir’s Krishna Ghati sector in Poonch district. As per Major Gaurav Arya, a retired Army veteran, the attack was launched by a Sikh Regiment unit. In the footage, the soldiers can also be heard, saying that the target has been hit successfully. Last week, Army Chief General Bipin Rawat had indicated Indian forces will retaliate following the mutilation of the bodies of two soldiers by Pakistan but declined to specify details. “You are asking for a future plan. The Army never gives out future plan. It is said only after it is executed,” he had told reporters. He was asked what the Army planned to do after the Pakistan Army mutilated the bodies of Naib Subedar Paramjeet Singh and BSF Head Constable Prem Sagar on Monday along the Line of Control in Jammu and Kashmir. The Congress Party on Sunday asked for a thorough investigation into the reports of Pakistan’s intelligence agency ISI funding separatist leaders in Kashmir to spread violence. Congress leader Tom Vadakkan said that such issues are serious and needs enquiry. “Whatever the information we have must be investigated because these are serious matters who are funding the separatists and who are the recipients of these kinds of funds. All this should be enquired immediately,” Vadakkan told ANI. Meanwhile, another Congress leader P.L. Punia asserted that now evidence that available in the regard, Pakistan must be unmasked. “Now we have evidences that ISI funds Hurriyat. Now there is a need to unmask Pakistan and isolate it internationally so that a pressure is built on Islamabad which would stop it from carrying out anti-India activities,” said Punia. The British Parliament has passed a motion condemning Pakistan’s move to declare Gilgit-Baltistan as its fifth frontier, saying the region is a legal and constitutional part of Jammu and Kashmir illegally occupied by Pakistan since 1947. The motion was tabled on March 23 and sponsored by Conservative Party leader Bob Blackman. It stated that Pakistan by making such an announcement is implying its attempt to annex the already disputed area. It was further noted that the attempts to change the demography of the region was in violation of State Subject Ordinance and the `forced and illegal construction` of the China-Pakistan Economic Corridor (CPEC) further aggravated and interfered with the disputed territory. The CPEC is a USD 51.5 billion project that aims to connect Kashgar, in China`s western province of Xinjiang, with the port of Gwadar in the Pakistani province of Balochistan. The Gilgit-Baltistan area is Pakistan`s northernmost administrative territory that borders the disputed Pakistan-occupied Kashmir. A committee headed by Prime Minister Nawaz Sharif`s Advisor on Foreign Affairs Sartaj Aziz recommended granting the region a provincial status, reports the GeoNews. India has said that any efforts to change the status of Gilgit-Baltistan region will not be acceptable. India on Friday expressed concern over the China-Pakistan Economic Corridor(CPEC) project being built in Pakistan-occupied Kashmir and said that it violates the country’s sovereignty. Briefing the media on the latest developments on the issue, MEA spokesman Vikas Swarup said New Delhi has raised its concerns to both Pakistan and China, as the “CPEC passes through sovereign Indian territory”. Beijing has invested more than $60 billion in CPEC aimed at connecting the western China with the Pakistani port of Gwadar near Karachi. This ambitious multi-billion dollar joint venture is a combination of road and rail travel before it reaches Gwadar. The venture has evoked a lot of reactions in India with some security analysts accusing China of encircling India to flex its geopolitical muscle in the region. The project also passes through the restive Baluchistan province in Pakistan. The Baloch people have been fighting for a sovereign homeland and have been accusing Islamabad of occupying their territory. Popular public rebellions against the “Pakistani occupation” in the recent past were brutally crushed by the government, forcing many of their leaders to live in exile, including India and other countries. Baluchistan is the largest province of Pakistan.